The Garmin nüvi 2495LMT is the top of the line 4.3” unit in Garmin’s 2012 nuvi Advanced series line. One of the more significant refreshes in recent years, the Advanced series adds several new customization options, improved search functionality and Exit Services. All models in the Advanced series come with preloaded maps of the US, Canada and Mexico. As the top of the line 4.3” model, the 2495LMT also offers voice command, Bluetooth for hands free calling, as well as lifetime maps and traffic. My one disappointment with the Advanced series is that these models do not have a powered mount. So you’ll have to plug the mini-USB connector into the back of the unit each time you use it. Nevertheless, the 2495LMT does sense when you remove it from the mount while powered on, and records that as your last parking spot. To be guided back to it, choose Apps > Last Spot. There is a magnet in the lower portion of the mount that helps it accomplish this. The nuvi 2495LMT powers off and on automatically when connected to the charger in your car. When you press the power button to turn it off, it actually goes into sleep mode. According to the manual, “a battery charge lasts for weeks” in this mode. The advantage here is an almost instantaneous power on from sleep mode. To fully shut down the device, hold the power button down for three seconds. There are eight different dashboards available on the 2495LMT. Basically, these are data field layouts. They are accessed via Settings > Map & Vehicle > Dashboards. You can see one in the image below. Of course on the 2×95 series you can also use voice command, just like on several other recent models. I’ll discuss that in more detail shortly. Voice command functioned very well in my testing, even in my noisy truck. I’m estimating that accuracy was at least 90%. In addition to the options shown below, there are also commands for Detour, Volume and Brightness. You can do one shot address or POI entry on the 2495LMT. Just say Find Address and then rattle off the entire address. Another improvement is that Find Place seems to work with nearly any POI in the database now. The voice command on this latest nuvi is getting very good indeed. The nuvi paired with my Motorola Droid on the first try. The next couple of times it tried to connect though, it would not stay connected. After a shutdown and restart of the nuvi, it worked fine, but I will admit to limited testing of this feature. When I called my wife, she said it was “damn good,” almost like talking to me directly on my phone. The unit I tested was a pre-production model. I did experience one shutdown with it where I had to hold down the power button for 15 seconds to get it to power back up. I haven’t heard of this issue with other 2xx5 series owners, so I’m attributing it to the fact it was a pre-production unit. I also noted slight delays in menu responsiveness (less than one second though). The 2555LT production model I’m testing is slightly faster, but it’s not instantaneous. POI searches seem significantly faster. Routing speed is somewhat faster than on my 2360LT with the trafficTrends historical road speed database enabled on both units. Names of nearby roads appear on the map – sometimes there are more of them and sometimes less than on the 2360. There are some text to speech improvements (BR, when associated with a highway number, is now read as “business route” instead of “branch”). And there definitely seem to be some routing differences. I’ll need more time to test those, but hopefully will have more to say in my 2555LT review in a week or two. This feature has been around a while. 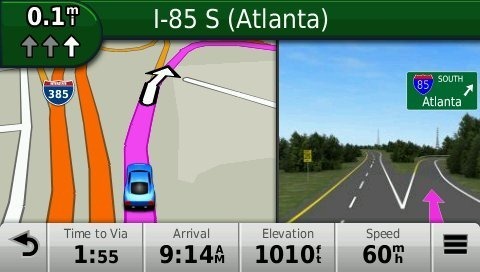 On past Nuvi’s instead of choosing faster, shorter, or less fuel route calculations you could also choose prompted where it would show the route of each and you could scroll through each route option to get the route and info. Right you are. Just found it buried in menus on my 2360LT. Thanks for the correction and glad you enjoyed the review. The 2555LT review should go a lot faster now that I’ve plowed through the feature set on the 2495LMT. Hi, again interesting reading, thanks. About trip planner screen shoot: is the time rally accurate? 18mph average? I’m using often routes with VIA on 3760 and I found that trips mostly don’t work for this purpose in real navigation. I’m afraid Garmin finally removed VIA feature and you can’t add VIA to current route without converting it into trip. Could you check this? I’m navigating to a destination. I enter a new one and it asks me if I want to Start New Route or Add to Active Route. If I choose the latter, a Trip Planer screen comes up, allowing me to sort destination order. This then becomes the Active Trip in the Trip Planner. This is what I mean, instead of getting route with VIA, I will get a trip with intermediate stop. Route and trip are different objects. For example on nuvi 37xx route is drawn whole till the end but trip only till next point. Actually trip is a set of simple routes. At the end of each route nuvi switches to the next one. Or it should switch, because in real use nuvi very often fails to do it. I have nuvi 37xx for almost a year. I was trying several times to drive a trip. None of this attempts was successful. On the other side, adding VIA to current route works well, like in any other simple nuvi. It’s a pity that Garmin removes this usable feature. I read somewhere how to stop EULA I accept screen but can not find it now. Don’t fully power on and off. Just tap the power button for it to go into sleep mode. Excellent review. You mentioned successfully importing a custom route based on Navigator POI’s. Is it possible to successfully import a custom route based on custom waypoints to ensure an exact route (scenic, etc.)? If you add enough waypoints, yes. But the nuvi will do its own route calculation in the field, and not necessarily the same one you see in BaseCamp. I don’t have a car GPS and have narrowed my search to this one – Nuvi 2495 – or Nuvi 2360. The feature sets seem almost identical and I’ve seen some good sales putting the 2360 under $190. Do you think the 2495 is worth the extra $$? If yes, why? Thanks Rich. One other thing; from what you said and what I’m reading from user reviews it sounds like the traffic ads on this 2495LMT are more frequent and intrusive than the 2360LMT. Can you confirm that the ads go away if you turn off the traffic feature on both models? Also how does the traffic routing work – do these models alert you of traffic and ask if you want to reroute, or do they do it automatically without notification? Yes, they go away if you disable traffic. It will automatically reroute you only if there is a severe incident. You can manually choose to avoid other incidents. Hi! This is the best reviews for garmin. Excellent, Excellent work. Everytime I have had serious long time finding the signals problems when changing from Puerto Rico to USA (Florida, Maryland) fin I presumed it was because the units (785, 855, 255) were looking at the Sats locations from PR. Later I changed the unit location ( turning on GPS simulation) and relocate the unit to Tampa and set my route and turned off. But the situation persisted, then changed to the newest 14×5 series but it was the same. I takes more than 20 minutes to find the sats everytime I travel from Puerto Rico. Then again I presummed it was some kind of signal black out in the airport areas because I got signal soon after exiting the perimetes, but last month I took out my 14×5 (I do believe is a 1495t) near Washington DC and another time (coming again from Puerto Rico) near Virginia and it was the same lengthy process even getting outside the car near 40 degrees waiting for a signal lock. How does it works ( I know it preloads some sats for a few days) and how can I make it lock faster next time (going back to tampa in 2 weeks) This situation seems to be the same on all Garmin models I used and on the ones my friends bought. Thanks for any advice (Planning to used the next Tampa trip as an excuse to buy model 2495LMT even we dont get any traffic service here in PR. 2- Will Traffic Trends learn the traffic from my trips or it will depend on traffic info from sat reception or any other service we don’t have here in Puerto Rico. -If it hasn’t locked by the time you reach your car and have left the parking garage, you might want to just stop for a minute or so once your car is in the open; in my experience you’lll get a lock much quicker if you aren’t moving. I’m pretty sure that Traffic Trends data is stored on the mapset and isn’t delivered via the traffic receiver. I don’t know how well it learns for your own trips though, but you should get improved data with each map update. I read through the reviews of 2360 & 2495 and comaprison chart BUT I wasn’t able to justify the price difference between the two generations of models and notable upgrades. Could you help list them for me please. Thanks.